VIDEO: The Queen of Fake News, CNN, broadcasts video of embattled VA governor, labeling him as a Republican. Honest mistake? Hell no! How do you know when you are finished as a Democrat politician? When CNN claims you are a Republican. Just when I think CNN can get no lower, they prove me wrong. 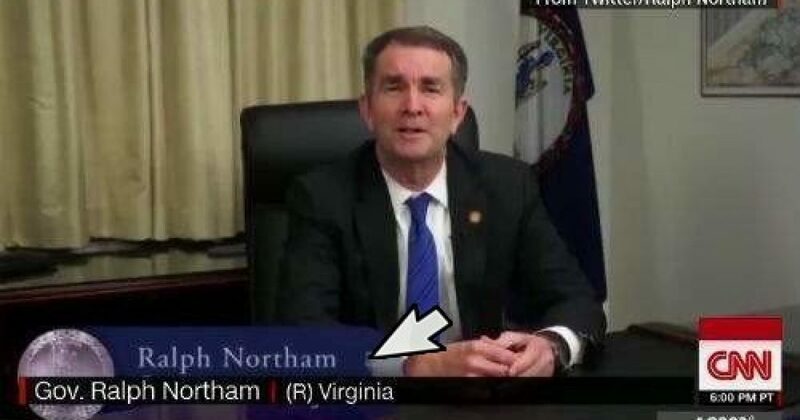 Now, the Queen of Fake News has deliberately (it is impossible for this to be an honest mistake) superimposed its own chryon over Virginia Governor Latham’s apology video, labeling the Democrat governor as a Republican. Governor Northam is practically on his knees in the video, begging forgiveness from his constituents over his most recent world-class blunder, the second in just a few days. Northam’s most recent blunder is a medical school yearbook photo that pictures a student in blackface standing beside an individual in a KKK hood and robe. The governor admitted on Friday that he is one of the individuals in the photo, although he denied that a day later. Following is the governor’s video speech to his constituents, wherein his own chryon labels him only as the governor of Virginia, without labeling his party affiliation, lest he be skinned alive by fellow Democrats. Now, CNN’s broadcast of the governor’s speech where the Queen of Fake News labels the governor a Republican…. Roger that, Sheriff! Some people label Democrats as liberals, some label them as progressives. I label them as the foulest, most dishonest, blind, stupid, corrupt, criminal scum to ever walk on two feet. Do I sound bitter? They could have correctly labeled Northam as a Democrat, the party that gave birth to the KKK and Jim Crow, and voted against civil rights. That would have been 100% honest, and, sadly, very much out of character for the Queen of Fake News. They could have included no party affiliation whatsoever, as the governor did in his original video. That would not have been inappropriate. Or, the lying bastards could have taken the familiar low road and listed an (R) beside the governor’s name to convince the fifteen mouthbreathing morons watching that the governor is a Republican. Not unpredictably, the demons at CNN chose door #3. Forced to publish a correction, CNN’s Anderson Cooper, begrudgingly, it seems, issued the correction but with no apology…. 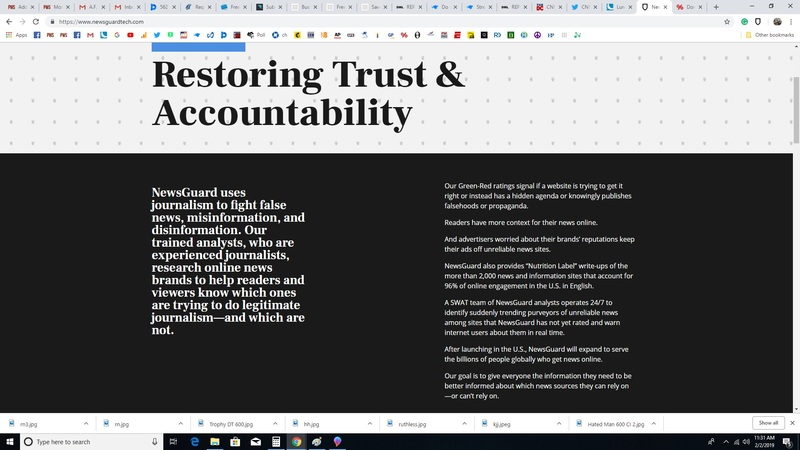 Speaking of fake news, we recently published a story involving Newsguard, the newest fake news enforcer employed by Silicon Valley to keep “fake news” (leftist code for anything published by conservatives). Yet, the leftist tool of dishonest liberals gives its highest rating, signified by a green shield, to CNN. Please read every checkmark. 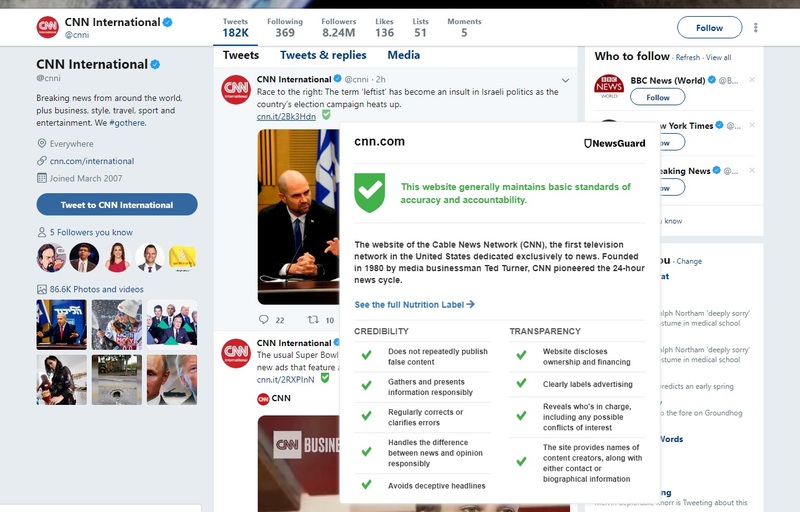 Does this describe the CNN you know? Screenshot…. This is how Newsguard describes itself….